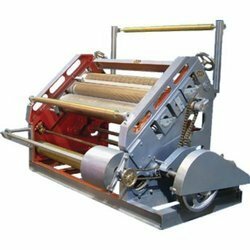 The automatic 3 /5 Ply corrugated making machine is used for 3 ply corrugated board on higher production volumes in minimum labor and time. High speed Corrugation Machine with variable speed drive- 2 nos. Drum type heaters - 4 nos. Self loading reel stand- 5 nos. Heating Unit for Drying of Pasted Sheets. Heavy duty cut off Machine. Drum type heaters - 2 nos. Self loading reel stand- 3 nos.